This comprehensive Mandarin workbook can be used with any textbook or on its own to dramatically enhance your Mandarin speaking and listening skills. No matter what textbook you're using to learn Mandarin, it requires a lot of practice. Here is a wealth of effective activities and drills—plus over 16 hours of audio recordings—to help you improve your spoken Mandarin Chinese quickly and effectively. This book follows the Basic Mandarin Chinese—Speaking & Listening textbook but works equally well with other coursebooks or on its own. The free disc contains hours of audio recording as well as printable PDF files providing hundreds of pages of extra practice exercises and activities. Respected Chinese language educator Dr. Cornelius Kubler has taught Mandarin Chinese to diplomats, business people and students for several decades—using an effective learning system with two separate but integrated "tracks" to help you learn the spoken and written forms of the language more efficiently and more successfully. The materials in this series have been acclaimed as a breakthrough in Mandarin Chinese language learning. 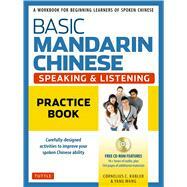 This book is a new edition of Basic Spoken Chinese: Practice Essentials. Cornelius C. Kubler received his Ph.D. in linguistics from Cornell and is currently the Stanfield Professor of Asian Studies at Williams College. Since joining Williams, he has chaired the Department of Chinese and held visiting professor posts at Middlebury, National Taiwan Normal University, Chinese University of Hong Kong and other universities. He has authored many books and articles on Chinese pedagogy and linguistics, and he served as a consultant for many Chinese language programs in the U.S. and abroad, including orientation programs for Chinese language teachers arriving in the U.S. He has chaired the SAT Chinese exam Test Development Committee and recently completed a two-year stint as Co-Director of the Johns Hopkins Nanjing University Center for Chinese & American Studies in Nanjing, China. Jerling Guo Kubler is a graduate of the Department of Foreign Languages and Literatures of Soochow University in Taipei. Her experience in language education spans several decades, and she has taught Chinese as a second/foreign language, all levels, from pre-kindergarten to university, at institutions in the U.S. and Taiwan, including Williams College, Eisenhower College and the Taipei Language Institute.